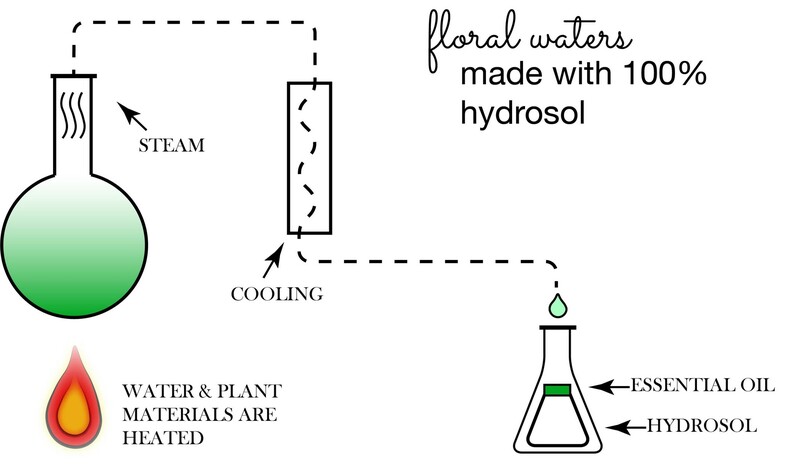 Hydrosols are traditionally known as “flower waters” and are made by distilling fresh flowers, leaves, fruits, and other plant material. In effect they carry the nutrients of the whole plant. These skin loving waters are gentle, effective, and wonderful for your skin. They have similar properties to essential oils, but these lovely aromatic waters are less concentrated. The aromas when compared to essential oils are very often, soft and subtle with a green herbaceous note to them. This comes from the water-soluble constituents in the plant material that are not present in essential oils. You may be wondering, what is a hydrosol? Hydrosols are powerful aromatic extracts that are produced when harvesting essential oils. Purified water and plants are heated to create steam and open the cellular pockets of the plant material, and then cooled. After the cooling process, we are left with essential oil, and a liquid containing water-soluble components of the plant, as well as microscopic droplets of essential oils. That is a hydrosol. We offer different scents to pick from: luscious rose, calming lavender, soothing helichrysum, energizing orange, and refreshing cucumber. janegee hydrosols are organic and extracted by artisan distillers who specialize in water and oil extraction. Often, they are the same farmers who grew the botanicals with wisdom handed down for generations. • They are anti-inflammatory because of the high content of carboxylic acids. • They’re super hydrating. Especially post workouts! • They make a great natural spritz for the skin so throw out your toner and feed your skin a little with a pure hydrosol. • They can be used to help heal wounds, sore throats and skin irritations. • Since they are much less concentrated than essential oils, they don’t need to be diluted and are even safe for infants and young children in baths or as spritzers. • They are safe to use on your pets. • They smell wonderful with a rich herbaceous scent, reminiscent of your garden in spring time. For me, I love to spritz my face and just soak in all the goodness. I use them on my face and whole body. Especially after a day in the sun. Spritz your favorite janegee floral water (pure hydrosol) daily to hydrate and decongest your skin, soothe and calm the mind. So, you can see the humble hydrosol has many benefits. But be aware of other products labeled as “floral waters”. Sometimes these are just water blended with essential oils. Always ask if your floral water is a pure hydrosol!